Great Plant Pick Award! Missouri Botanical Garden Plants of Merit award winner! This spirited late-spring to early-summer bloomer can be set in the ground in spring after all danger of frost has passed, or in early fall. A vigorous hybrid from Japan with bell-shaped dangling flowers borne in summer, and glossy tufted seed heads providing beauty for the rest of the season. Its mounding, non twining habit creates great swags on supporting shrubs or fences and can be tied to supports placed early to guide it upward. Add gravel and compost to heavy soils to improve drainage. After planting add a 1-2" thick layer of mulch around the plants (keeping away from the crown), to conserve moisture. Prune back to 1' in earliest spring just as the buds swell, cutting back to a strong pair. *Take care when handling, planting, and cultivating, as damage to the roots and stems can cause plants to wilt and die. Watering Details: Water regularly—provide about 1" twice per week for the first month after planting to establish, and about 1" per week thereafter during the growing season and in future growing seasons. Soil pH: Will do just fine in most soil pH levels. Fertilizer: Apply an organic water-soluble fertilizer in spring, reapplying every six weeks throughout the growing season. Diseases & Pests: Roguchi' is resistant to wilt but may occasionally be susceptible to other fungi; if disease is evident, be sure to prune out all diseased portions (with CLEAN pruning shears) and remove from property or destroy them—do not throw in compost. Disinfect pruning tool with a bleach solution before and after. Application of an organic fungicide will help prevent further infestation. Aphids might appear—hose down the plant daily until they are gone, or take preventive measures by misting or hosing down regularly. 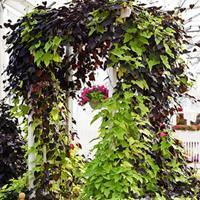 Plant: Dense foliage clumps of ovate medium-green leaves on rambling vines. 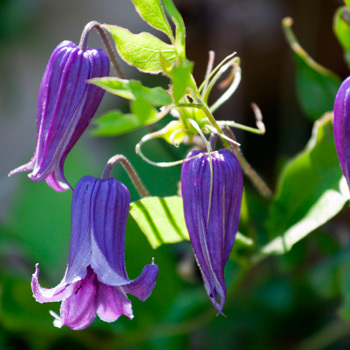 Flowering: 2 ½" long bell-shaped purple-blue flowers arise from foliage on black stems. Seeds: Flowers will turn into attractive silvery tufts, containing small brown seeds. Very interesting in autumn. Bred in Japan, 'Rooguchi' was created to be a solitary blossom for the Japanese tea ceremony.